UW-Stout is calling all students who have a good business idea or who are interested in entrepreneurship. 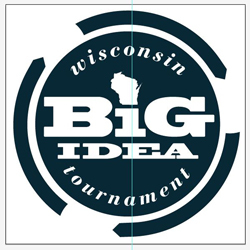 The Discovery Center Fab Lab, room 132 of the Applied Arts Building, will host a kickoff event from 10:30 a.m. to 1:30 p.m. Wednesday, Oct. 22, for the Wisconsin Big Idea Tournament. The tournament, coordinated by UW-Extension, is open to undergraduates from any UW System two- or four-year campus except UW-Madison. Students from the state will compete against each other to determine the best student business idea. The state finals are April 11 in Madison. The state winner advances to the International Business Model competition. At the Oct. 22 event in the Fab Lab, students will learn about the contest, network and discuss their ideas. Refreshments will be provided. Eventually, two teams will be chosen to develop their ideas and represent UW-Stout in the state competition. During the tournament, students will have access to resources from the UW System. Some funding may be available. The tournament teaches students cutting-edge Lean startup tools, provides business mentorship and gives students a chance to compete for paid internships along with the top prize, according to the contest website. For more information, contact Discovery Center Director Randy Hulke, 715-232-5024, or the Discovery Center, 715-232-2395. More power!? Or FABLAB Fridays are really fun. 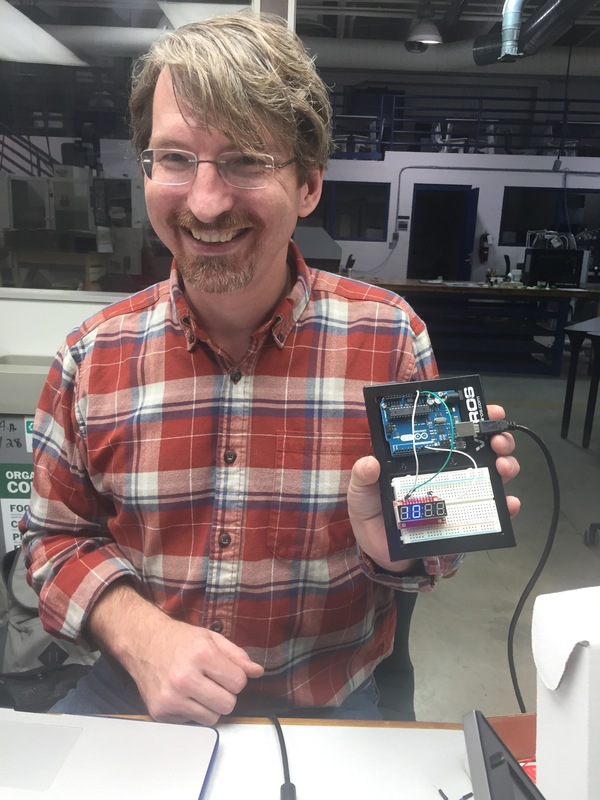 Today Todd spent FABLAB Friday working on his Arduino and getting the LED display working for the water quality sensor. 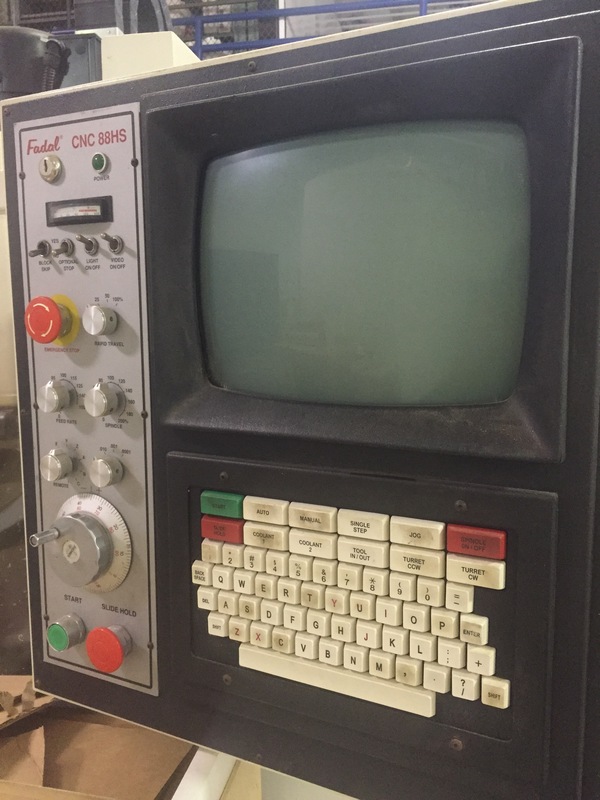 We cheered his success and pondered whether the Arduino or the computer in the old CNC mill was a more powerful processor. Our money is on the Arduino. Sylvia and Todd discussed next steps with their environmental sensors and Anne Kerber and I mastered some new methods of online communication and IT. 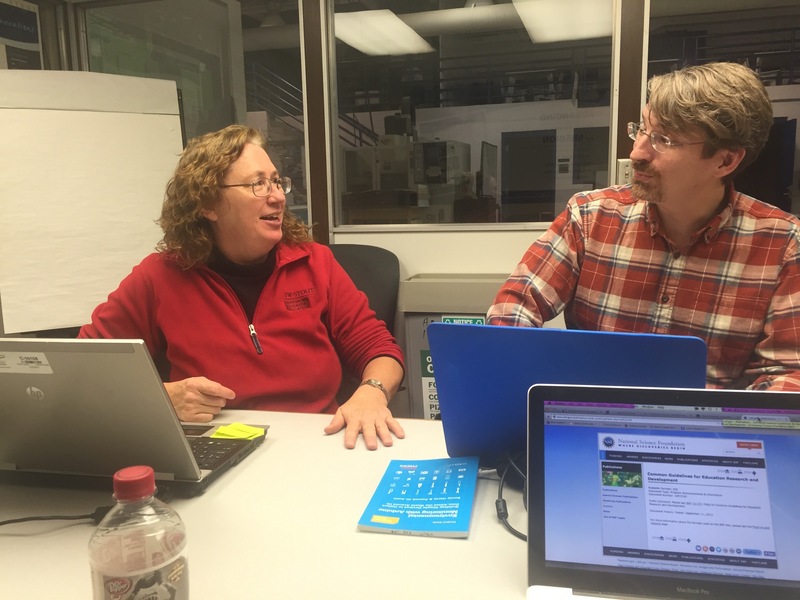 Anne, Sylvia and I spent the last few hours of this week’s FABFRIDAY making excellent progress on our grant proposal to create more opportunities for faculty, schools and community members to learn and play in the FABLAB. I’m slowly making progress on my standing desk. I’ve researched many different standing desk designs and surprisingly found many good ideas from about a dozen different Kickstarters, so it was neat to see I was certainly not the only person thinking that this would be a popular DIY project. Sylvia introduced my to Sketchup and Inkscape and I’ve been learning how to draw basic shapes. A few weeks ago Sylvia and I worked out some basic pieces and got the files to transfer to the laser printer. I’m now working on a cardboard mock up of my design and will be translating that to the CNC Mill. All in all this has become a great activity for me, I’ve gone from a few months ago thinking I could never do any real “building” to now looking up CNC furniture plans and realizing I could not only make someone else’s design on the mill but could design my own. It has also helped me to understand the real value of a fablab isn’t just in the equipment and tools that are available to us, but the shared ideas and knowledge. Stay tuned! We hope we can roll-out a standing desk for very low cost using recycled materials by sometime this spring (noting I’m sure someone who was actually skilled in this area would’ve been able to do this much, much more quickly, but for me it was the experience in journey, not the product that mattered most). Just a reminder that we have another FABFRIDAY opportunity tomorrow, Sept. 26 from 12:30-3:30pm. We will take the first 10 minutes to allow folks to briefly update, (including a new participant who will be assisting with coordination of a Spring 2015 Maker Faire). Various equipment training opportunities will be offered by Mike Cropp. All are welcome! 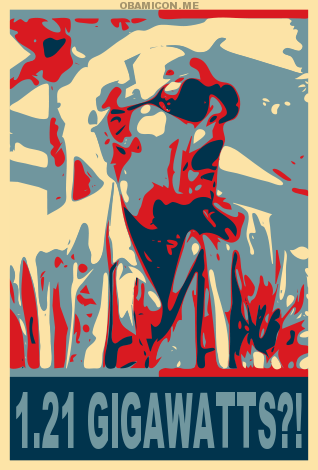 Maker Faire Flyer from a West Coast Event….We’re coordinating now to do this at UW-Stout spring 2015. Kinect Scanner Works with New Graphics Card! Progress has been made. Yesterday I installed the new graphics card that the Discovery Center ordered for us. It was an easy install and the Kinect Scanner is working great. We now have the ability to scan at the macro level all the way down to small. Who wants to tackle the micro – level scanning?? Our summer work has progressed! We have started the FAB-FRIDAY Campus Cohort, open to all UW-Stout faculty, staff and students interested in learning more about the FABLAB. Our cohort currently consists of people working in the FABLAB, want to work in the FABLAB or want their students to have the opportunity to work in the FABLAB. Join the FABLAB Cohort in the UW-Stout FABLAB Fridays 12:30pm until you’re tired!! 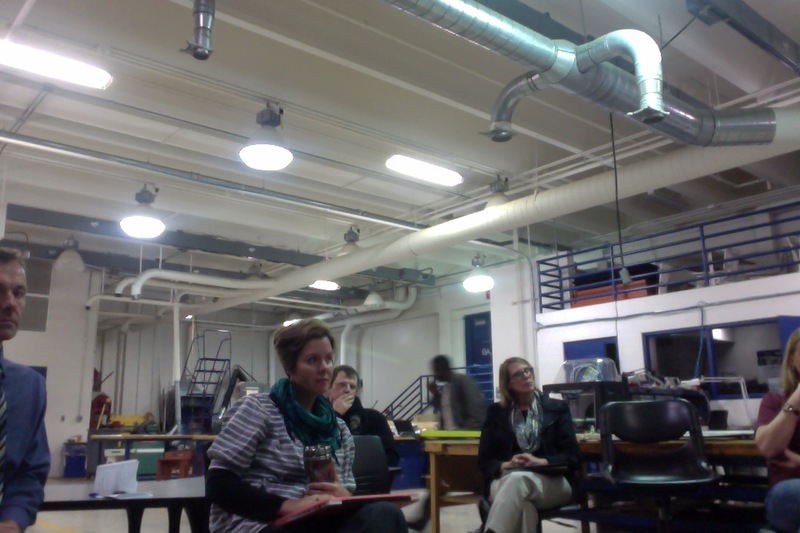 Our First FABLAB Friday Cohort Meeting. 1) Communicate upcoming and ongoing FABLAB opportunities. 2) Share knowledge, ideas and resources among the cohort and broader community to build capacity and create infrastructure that supports the FABLAB. 3) Build, create, experiment, explore, solve problems and create opportunities for a truly transdisciplinary work environment. Sylvia has been working with 123D Catch so I wanted to try some other software alternatives to see if I could get any better results. I came across VisualSFM and decided to give it a try. Normally I prefer to handle these sorts of things with my own code, but I wanted something that anyone could easily make use of. 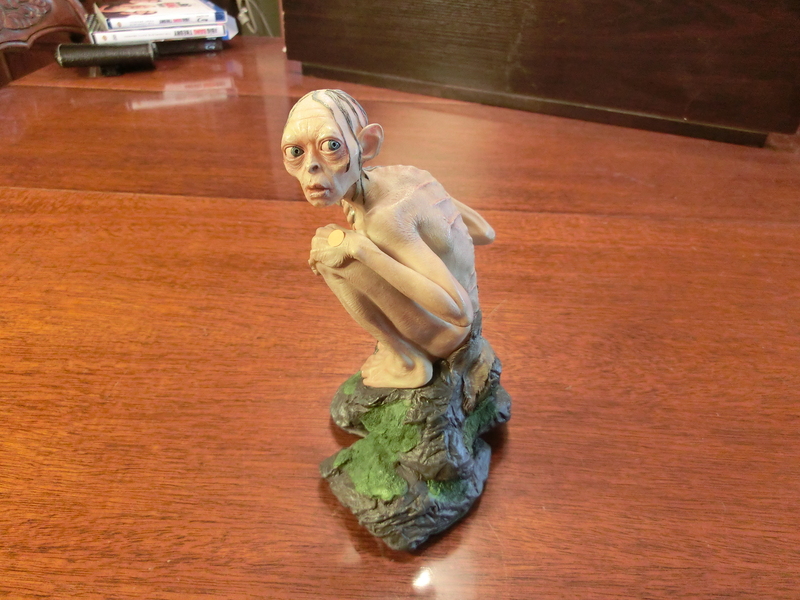 Golum is going to be my model for this project. I had used a different object earlier that didn’t have a lot of surface detail and the algorithms couldn’t find matches between images to create a model. One way our brain produces a three dimensional image from the world around us is using stereoscopic vision. Our eyes can detect the difference in the direction traveled by the light rays entering each eye and that difference allows us to extrapolate the position of the object. Another way to determine the position is by observing how the position of an object changes as we move. If you go for a walk in a straight line, you will notice that objects closer to you change their relative position to you much faster than objects that are farther away. You make use of this fact to determine relative distances to objects as you move. 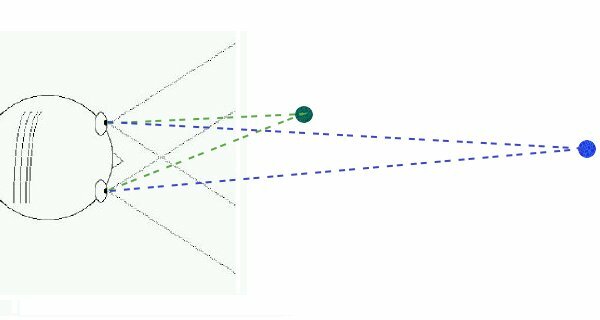 The way Structure from Motion works is to look at how easily identifiable points on a model change their position in the image as the position of the camera changes. If you change the position of the camera and notice that one point on the model changes quite a bit but another point doesn’t change much, the part of the model that moved the most is closer to the camera. VisualSFM actually shows you the location of the cameras around the model, which comes in handy for finding gaps in your camera coverage. The software determines the relative positions of the camera and the sparse point cloud using the matching points on the model found in each pair of images (the point cloud is the set of x, y, and z coordinates that define each point found on the model). 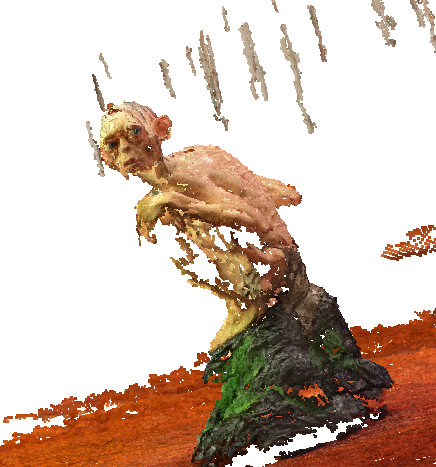 The sparse point cloud gives a rough outline of the model. Another routine (CMVS in the case of VisualSFM) then creates a dense point cloud which uses the sparse point cloud to create a higher quality image. 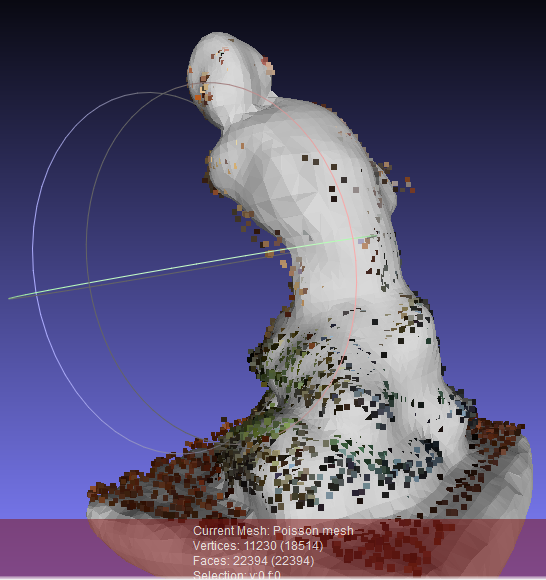 Once the point cloud is created you can use another software package to create the mesh that defines the image. 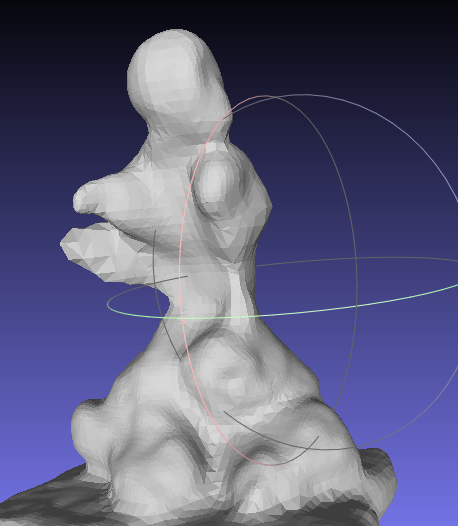 I used Meshlab to clean up the point cloud and then generate the mesh. You can see the results below. Lighting, lighting, lighting. The camera needs good consistent lighting to identify common points in pairs of images. Only make small movements between pictures. The more points in common between pairs of images the better the results. Make sure you model has a lot of detail. The matching algorithms can’t find matching points in the images without details on the model. Look at the camera positions in VisualSFM. If you see an area where cameras are not present, go back and take more pictures to fill in the gaps. 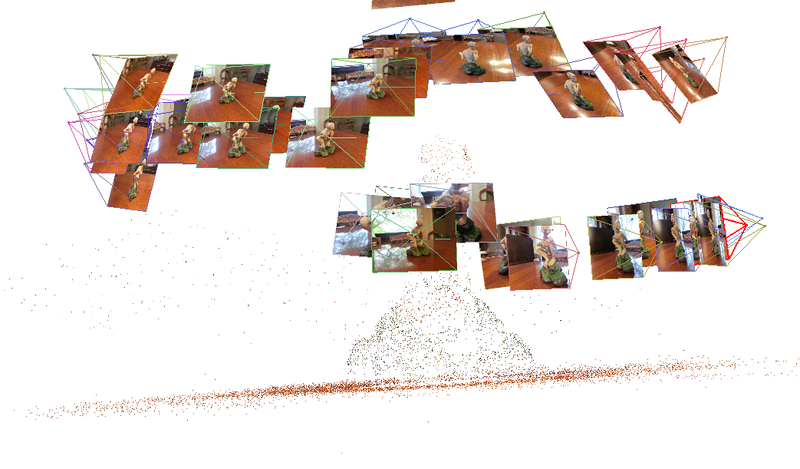 It really helps if you use the dense point cloud to make the model and not the sparse point cloud. 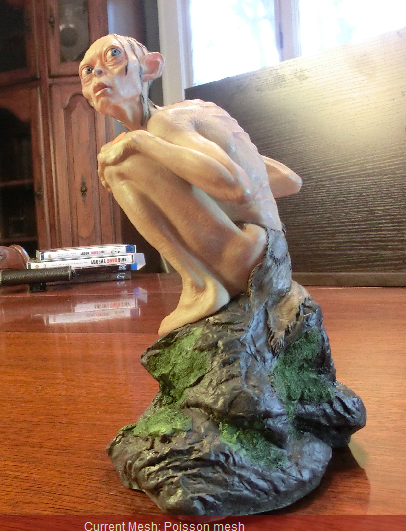 The model looks much better and you can even make out the facial features. I think with some more tweaking it could look pretty good. 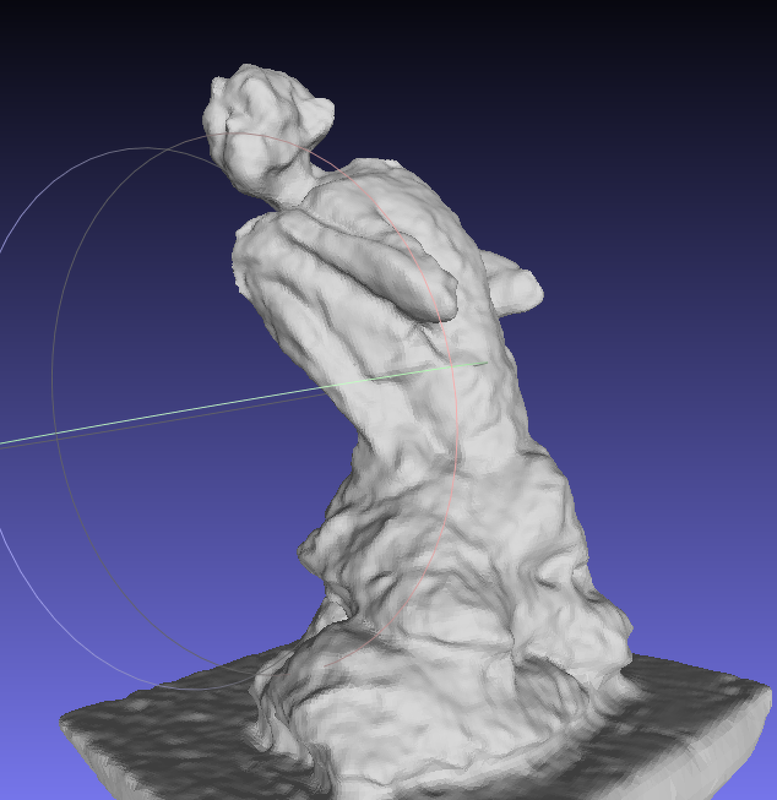 I was able to download Autodesk’s Meshmixer which is compatible with 123DCatch and repairing 3D scans before printing. I think you can also draw from scratch if desired. Theoretically I could repair the scans of myself but note that my face really isn’t that clear. It is interesting to note that the texture of my jeans and shirt was captured. We need to find a better way to scan people – quicker with less time making repairs and more accurate features. There still may be some tweaks but this is definitely a step in the right direction. I will be doing more work with the image and seeing if I can clean up the mesh and perhaps do a 3D printed version of myself. kitrinkles on FAB-FRIDAYS HAVE BEGUN!! Robyn on FAB-FRIDAYS HAVE BEGUN! !